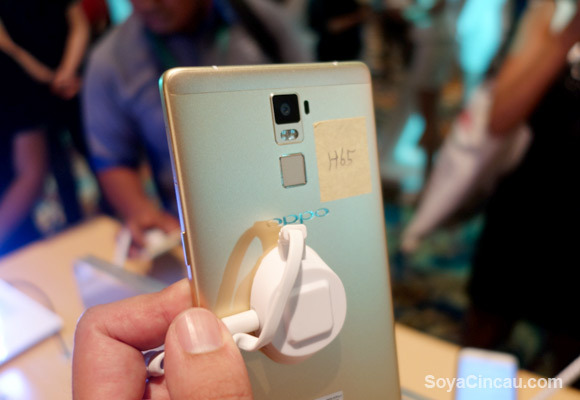 OPPO has introduced its R7 series, its latest offering for the Malaysia market. 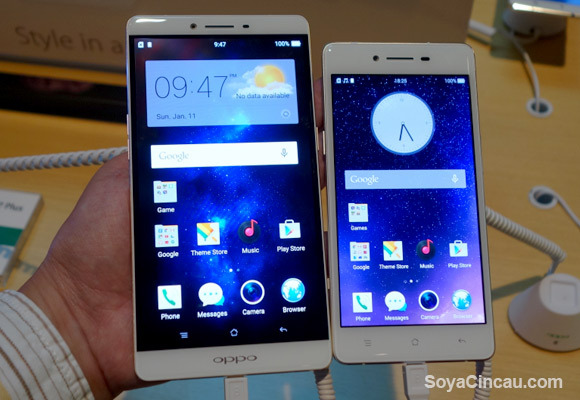 Announced earlier in May, OPPO Malaysia is bringing 2 models, the R7 Plus phablet and a more compact R7 Lite. For the Malaysian market, we won’t be getting the original R7 but instead we are getting the R7 Lite that offers lower specs and it carries a much lower price tag. 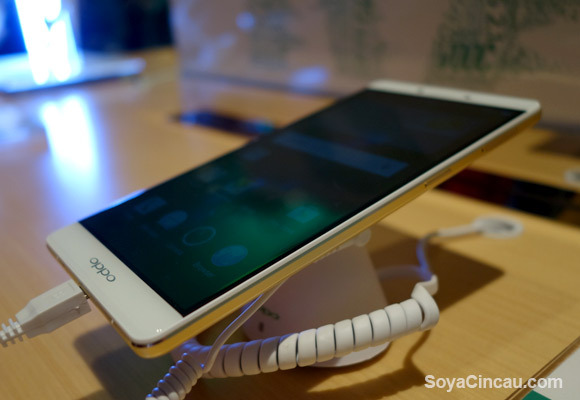 As other manufacturers have been pushing specs for their new flagship models, OPPO on the other hand decides to focus on premium design with slimness as their main highlight. Powering the devices is a mid-range Snapdragon 615 Octa-Core processor that’s also found on the Mi 4i, OPPO R1x and Galaxy A7. The R7 series offers a unibody metal frame which is apparently inspired by the design of a violin. 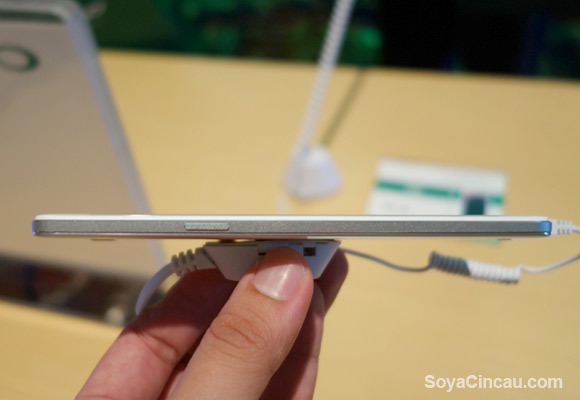 It is thin to hold but the R7 isn’t as thin as their once world record holder, the R5 which boast a ridiculously thin 4.85mm side profile. The R7 Plus is a huge device with a 6″ Full HD AMOLED display but it manages to boast a high screen to body ratio with the use of on-screen buttons for the front. Overall it feels quite a well polished device with the use of 2.5D glass which makes the edge smoother to touch and it manages to keep its bulk in check with a 7.75mm thickness. With a 4,100mAh capacity battery, it feels heavier at 203 grams, but at least it’s lighter than the former 5.9″ OPPO N1 (213 grams). From a design perspective, it does remind us of the Huawei Ascend Mate 7 which coincidentally also comes with a 6″ display, a rear mounted fingerprint scanner and a 4,100mAh capacity battery. 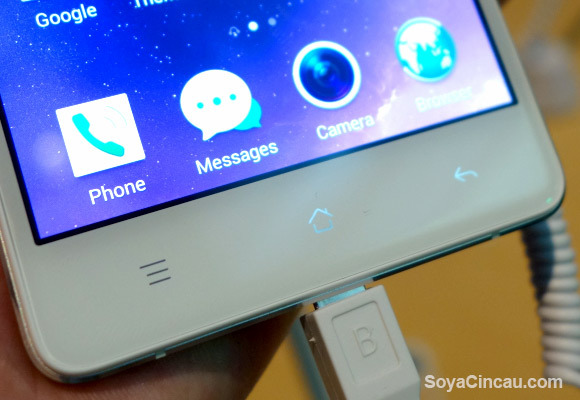 In terms of specs, the Mate 7 may have a better processor but it loses out in the camera and fast charging department. Under the hood, the R7 Plus gets a Snapdragon 615 processor that’s mated to 3GB of RAM with 32GB of on-board storage. 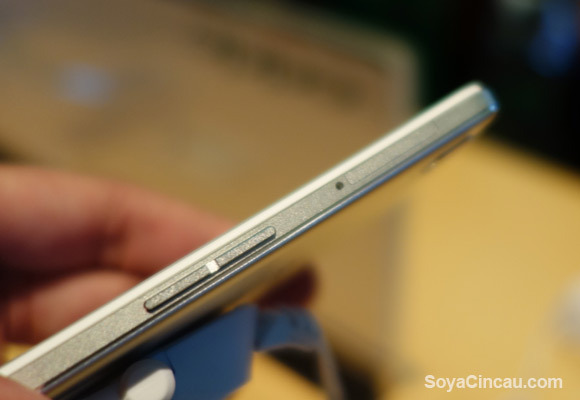 You can expand up to 128GB extra via microSD card which would utilise its secondary SIM tray slot. Connectivity wise, the R7 Plus supports 4G LTE on both SIM slots as well as WiFi 802.11ac and Bluetooth 4.0. In the camera department, the main shooter uses Sony’s 13MP IMX278 camera sensor that’s similarly found on the Huawei P8. It boasts a quicker 0.1 second focus time with its Phase Detection AF and the sensor is a 4-colour RGBW unit. It is assisted with a dual-tone LED flash and there’s a laser auto focus light for guidance. 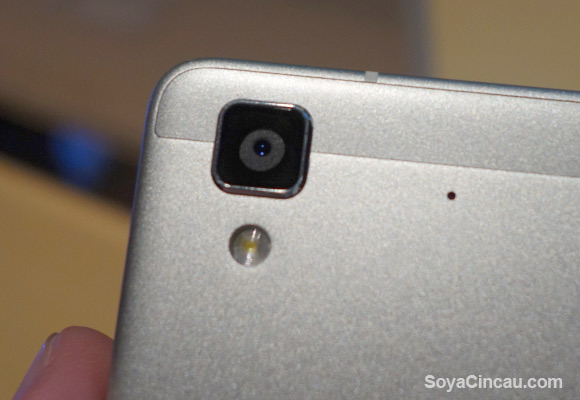 Over at the front, there’s an 8MP camera with Beautify 3.0 selfie feature. 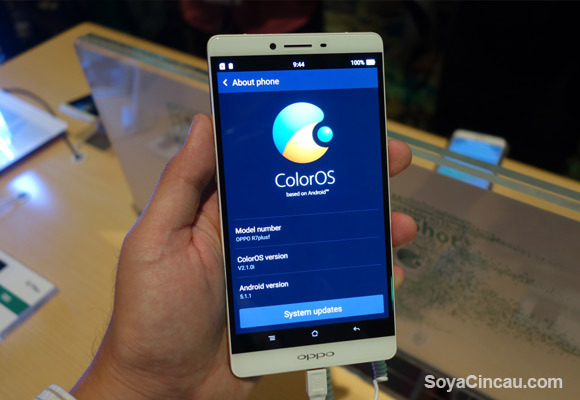 Out of the box, the R7 Plus is running on their latest iteration of ColorOS 2.1 which is based on Android 5.1 Lollipop. 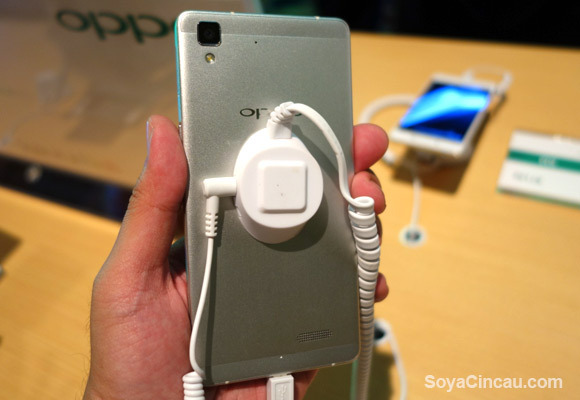 Finally OPPO has a smart phone that runs on a newer operating system as the past few models have been stuck with KitKat or an older version. 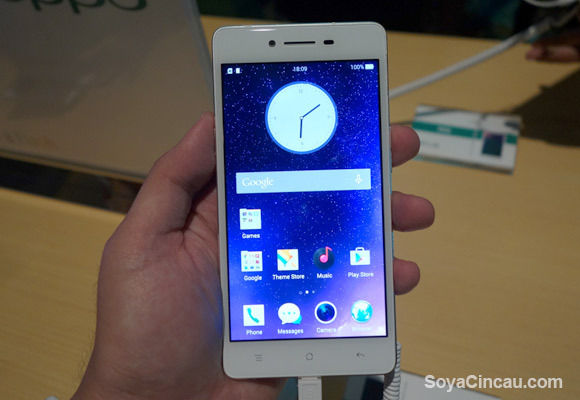 According to OPPO, the new ColorOS has been improved for faster boot times, stability and smoothness. In our short playtime, it does feel quick and that’s to be expected with a fresh new device with 3GB RAM. Like its previous flagship offering, you can double tap to wake or launch apps from sleep by drawing gestures on the screen. 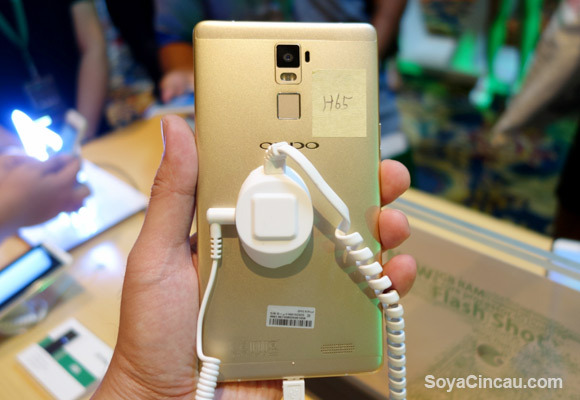 Also supported is VOOC Flash Charging which boast faster charging in a shorter time. During its media launch, we are told that the R7 Plus is still capable of doing 75% charge in just 30 minutes, and a 5 minutes charge is enough to sustain 2 hours of talk time which is quite remarkable. Priced at RM1,998, the R7 Plus is quite a high price to pay for a Snapdragon 615 powered device but it tries to make up for it by having a larger screen, bigger battery capacity and having a more premium build quality. The R7 Plus will be open for pre-orders on 11th July with official availability targeted for early August. 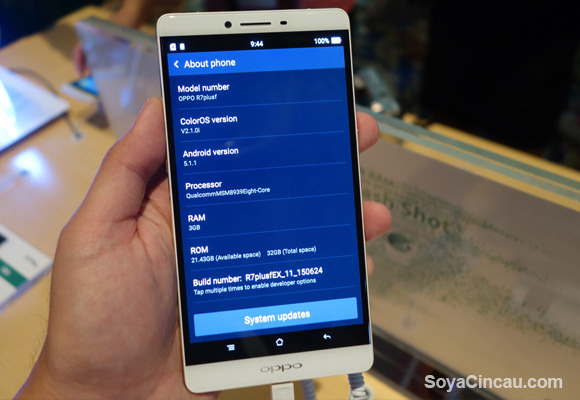 UPDATE: We’ve been informed that the “OPPO R7 Lite” shown here is actually the original R7 that comes with a Full HD display and has 3GB of RAM. 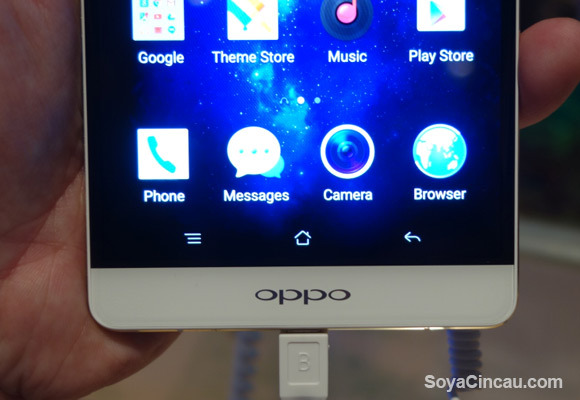 However the exterior design and dimensions are identical with the OPPO R7 Lite. 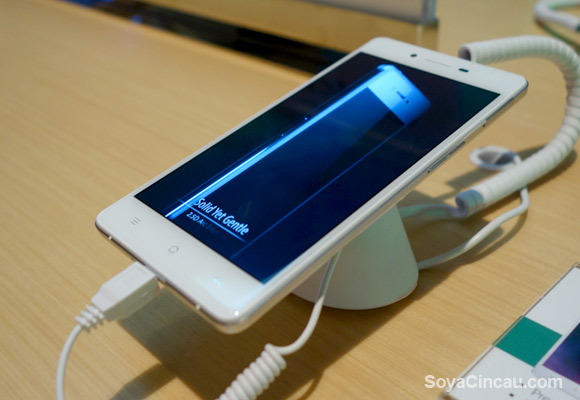 The next device is the R7 Lite which is priced at RM1,298. 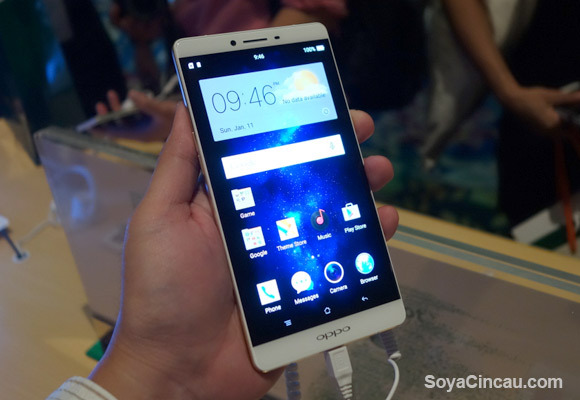 When we asked why is OPPO offering the R7 Lite instead of the full fledged R7 in Malaysia, we are told that this is to cater for a price sensitive segment since the R7 Lite is priced at RM700 lower than its top of the line R7 Plus. On the exterior, this is essentially the same R7 with a 5″ display but it is downgraded in terms of RAM with just 2GB (instead of 3GB) while the screen resolution pushes a standard HD 720p resolution instead of Full HD. The build quality is similar with its R7 Plus with a metal unibody design as well as a smoothen-out 2.5D glass for the front. The R7 Lite feels more refined with more curves and polished frame, as opposed to its similar spec-ed R1x that has more sharp edges. 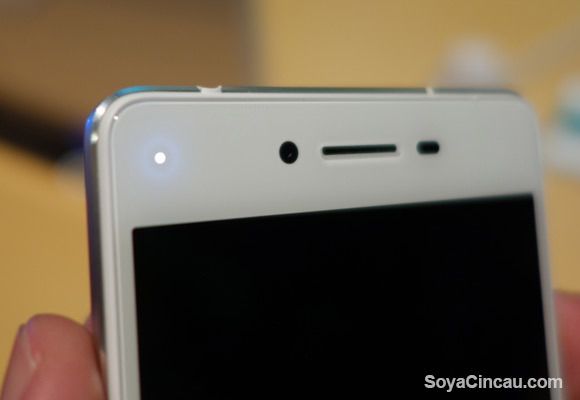 On the front it gets 3 capacitive buttons which are not illuminated, while the back gets a clean metal back with its camera and LED flash being positioned at the top left corner. 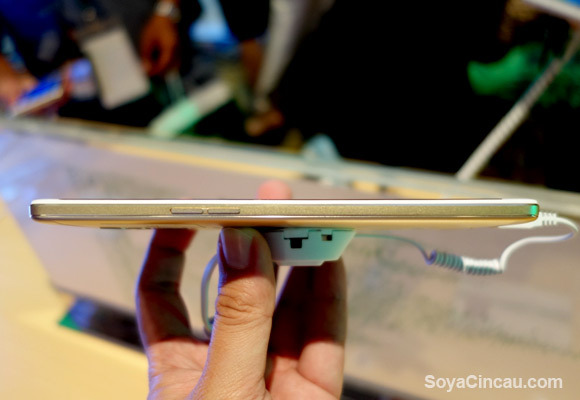 In terms of thickness, the R7 Lite is 6.3mm thin, which is the same as the Galaxy A7, Samsung’s thinnest smart phone at the moment. The speaker like its bigger R7 Plus sibling is positioned at the back of the device, which we felt could better place on the bottom of the device. For taking pictures, it gets a 13MP main camera while the front get a high resolution 8MP shooter. 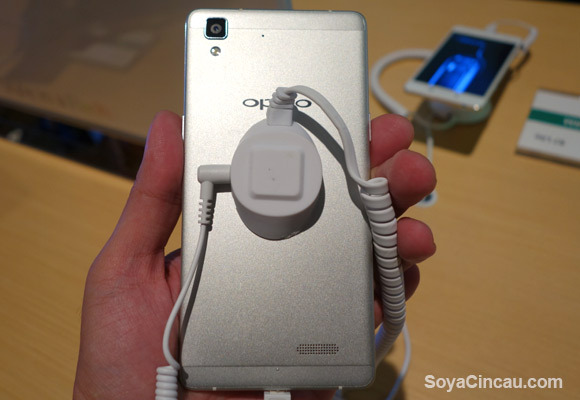 Being a “Lite” device, another omission is the lack of VOOC Flash Charge but it still claims to have a Fast Charger without mentioning its actual charge rate. Under the hood, it gets 2GB RAM, 16GB of storage and it also supports dual-SIM with 4G LTE. 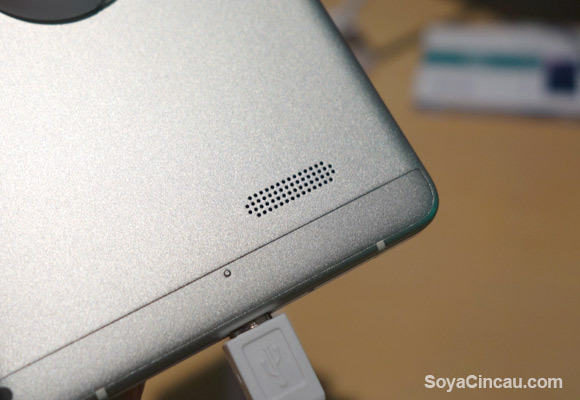 If you need to expand more storage, the 2nd slim slot also doubles up as a microSD expansion. During the launch, the R7 Lite is still running on KitKat but we’re told that it will be running on the latest ColorOS 2.1 with Android 5.1 by the time it goes on sale. It’s a nice device but it is quite hard to recommend this over higher spec smart phones within the same price range like the highest spec ASUS ZenFone 2, OnePlus One or Honor 6. 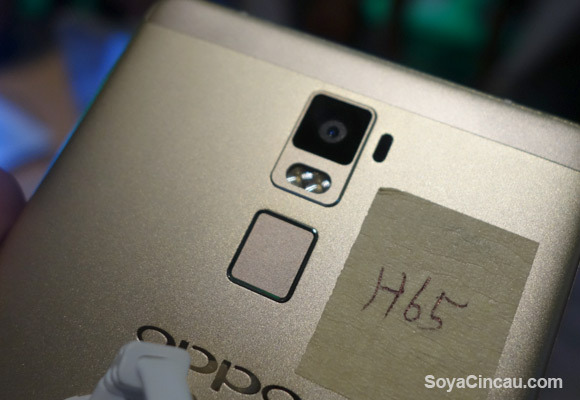 OPPO R7 launching in Malaysia on 7th July?